This screenshot is from a video posted to Facebook Ashley Jimenez. The video shows her husband, Ismael Jimenez, arguing with police officers after they were called to the Cinemark movie theater in West Philadelphia. The Jimenez family had asked for a refund because of a beeping noise in the theater, but they said they were told they couldn't go back into the theater to get their kids after getting the refund. Going to the movies is not cheap. Taking six kids to the theater — and buying them all snacks — cost Ismael and Ashley Jimenez a total of $135. That's why, after enduring an annoying distraction throughout a showing of "Jurassic World: Fallen Kingdom" on Friday night, they wanted their money back. They had taken their four kids and two of their friends to see the film at the Cinemark University City Penn 6 in West Philadelphia, but during the movie were irritated by a constant beeping sound. What unfolded has since gone viral on social media, with the couple saying they were denied entry back into the theater to get their kids after requesting a refund. Ismael Jimenez, of the city's Logan section, believes the situation could have been avoided if the theater's manager wasn't so quick to get police involved. "To tell you the truth, I can't get over the absurdity of the situation," Jimenez told PhillyVoice. The beeping was loud and consistent, so Ismael Jimenez, a 36-year-old school teacher at Kensington High School for the Creative and Performing Arts, went outside about 20 minutes into the film to talk to someone about the noise and was able to get the attention of a staff member. The staff member said he would get the manager, but Jimenez waited 15 minutes and the manager never showed. He was able to locate the manager near the front of the theater and the manager told him they would handle it. Back in the theater, the beeping continued for another 20 minutes, Jimenez said. Frustrated, Ashley and Ismael Jimenez, along with their 3-year-old child, went back out to ask for a refund, which they were granted. That's when the trouble started. After getting the refund, the parents explained they needed to go back in to get the other five kids, who are between the ages of 6 and 12. According to Jimenez, the manager said no and asked them to leave. "We're like, 'No, we got to go get our kids,'" Ismael Jimenez said he told the manager. Jimenez said it became a "circular" argument — the Jimenezes kept explaining they needed to get their kids from the theater, but they were repeatedly told they had to leave. Eventually, Ashley Jimenez ignored the manager and re-entered to get the couple's children and their friends. A request for comment was made to Cinemark on Monday afternoon. By Tuesday morning, no one had responded. 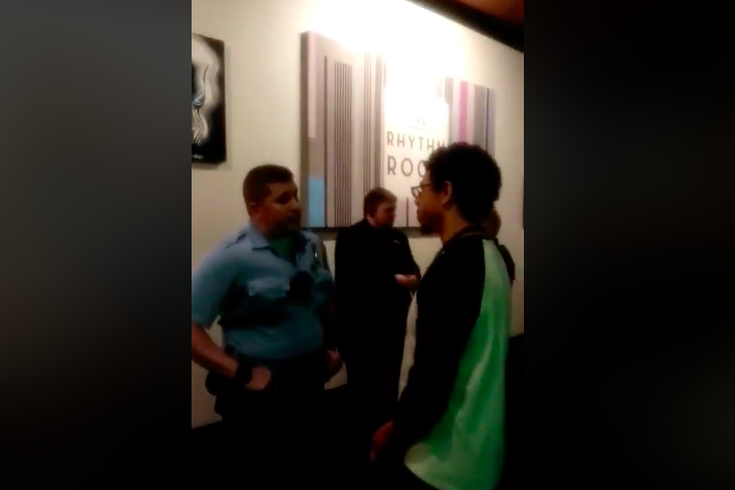 A police officer and a private security guard already were present at the theater before the incident started to play out, and Jimenez said they confronted him and were "standoff-ish" and "avoiding eye contact, being overly aggressive before we got upset." "Treating us like a threat right from the jump," Jimenez said. That's when Ashley Jimenez started recording. The video shows her husband arguing with the multiple police officers who were called to the scene. Ismael Jimenez said at that point he was asking for a concession refund, as well, which he hadn't planned on requesting until the "absurdity" of the situation escalated. Ashley Jimenez posted the video to Facebook, and it has since been viewed nearly 50,000 times. Officer Troy Brown of the Philadelphia Police Department's public affairs unit confirmed that police had responded to a disturbance at the theater around 9:39 p.m. Friday, but declined to provide more details about the incident. Ismael Jimenez said one officer recognized that a police presence wasn't necessary and was able to secure them their concession refund. After that, the police dispersed and they went home. In her Facebook post about the incident, Ashley Jimenez used the hashtags #WhiteFear and #ComplainingWhileBlack. Asked whether race played a factor in the incident, Jimenez didn't explicitly say that the color of his family's skin was the reason they were treated a certain way. He did, however, cite a number of recent incidents in which the police were called on people of color during seemingly innocuous situations: an 8-year-old girl selling water from her stoop, a group of people enjoying a BBQ and, of course, two men waiting for a business meeting in a Starbucks. "This is starting to become an ongoing theme where the police are used as the default position when trying to handle a situation," Jimenez said. "We don't have to deal with you, we're going to call the cops on you. It's starting to happening a lot, or being recorded a lot." Jimenez said he's had similar incidents happen in other parts of the country, but never expected something like this to happen here. "I've taught black history in Philadelphia for the last nine years, but I never thought something like that would happen to me in Philadelphia."